“Bad Man’s Gift” by John E. Rogers, Jr. The first case is that of a caretaker goddess in “The Lingering Grief of Twilight” by Geoffrey Thorne. 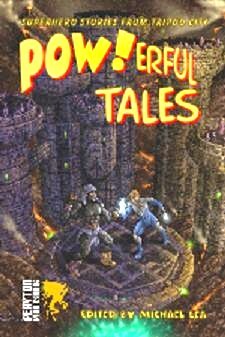 In this solid start to the shared universe of POW!erful Tales, Thorne tells a bittersweet tale of maternal love, loss, and starting over. The goddess Twilight, who has adopted Earth as her protectorate, must battle a devouring force that in some manner is of her own creation. Killing these creatures, then, is tantamount to killing part of herself. While Twilight’s eventual triumph is never in doubt, the back story and internal conflict of the goddess keep the story from becoming overly simplistic. What’s more, Twilight’s internal conflict also serves as a harbinger for the struggle within every superpower character throughout the rest of the anthology. It raises the question: what is the superhero’s motivation in confronting super villainy in light of the fact that no “hero” acts with complete altruism? It’s an interesting thematic element in this collection, and one worth considering if the reader wants more from these stories than mere fictional expressions of beat-’em-up vigilante justice. In “What Are the Odds?” by David Taub, this internal struggle takes a humorous turn when a crime fighting hero chances upon the evil Gabriel, the “planet’s worse nightmare,” who has just finished constructing a doomsday device. Our protagonist is a minor hero who hates his power of probability since he never knows what mess he’ll end up in next. As a result, he’s dubbed “The Clown.” And since he’s really only good at retrieving kittens from trees, The Clown looks to be in over his head when he confronts Gabriel and discovers that the countdown to doomsday has begun. With no opportunity to call upon the League of Champions, our unlucky buffoon bumbles along the best he can – against all odds! Of course, this a cute, over-the-top humor piece, so we aren’t too concerned that our hero will fail. But then, maybe his luck can hold for only so long. Christina Lea’s “The Man Comes Around” is darker than the opening stories and is more complex in plot and character development. Here the reader is confronted with the nature of good and evil, or at least gets a glimpse at some of the forces that may lie behind order and chaos. These forces are made manifest in gemstone-like beings of light and color and electric power. The godlike entities on either side of the conflict enlist and bond with human beings, transforming them into superhuman fighters that wage their war on earth. I’m making this sound too abstract; the tale is really an interesting origins story of a new crew of superheroes and their foes. The author does a fairly good job at placing something odd and alien into a more familiar setting, and then tying it all together in an engaging and descriptive story of survival. “Day of Wrath” by Jon S. Crews rounds out the first section of stories and is a hopeless tale of death and destruction that speaks of the devastating reality of unleashed chaos and evil upon society. The story is creatively told as a transcription of a recorded deposition of the tragic deaths of the protagonist's fellow police officers. The narrative is a bit clunky, however, as the literary device breaks down on occasion since it is difficult to maintain the aural element of a courtroom testimony in written form. Also, the eye-witness giving his account sounds more like a traditional story teller and gives us information from an omniscient point of view on occasion. Still, the ending was nicely done and, although anticipated, captured the tragic theme of the story. The theme of super-crime binds the next four stories together, starting with “Bad Man’s Gift” by John E. Rogers, Jr. This first person narrative recounts a seminal adventure in the life of Samcrow, the world’s best Sender – a person with a power that can send any object anywhere. Samcrow is a semi-bad guy, a loner (not part of the Super Villain crowd), but one who will do good things for the right price. When the League of Champions calls upon him to exercise his unique abilities to save a young boy from a creature from another dimension, he balks. But at the urging of another semi-bad super hero, we witness the expected transformation of character. The writing is fair and the author peppers the protagonist’s speech with vulgarities that never seem to ring true, but maybe that’s just an indication that the semi-bad Samcrow is really, deep down, semi-good. Lawrence Barker tells a humorous crime-doesn’t-pay tale in “A Very Small Hero.” Willie, with an inferiority complex that just won’t quit, discovers he can separate his hand from his arm and send it wherever he wants! Struggling to simply pay his cable TV bill, Willie now has a way to make ends meet – illegitimately of course. So he tests his newfound ability on some minor criminal escapades to disastrous results. His life of crime is cut short, however, when he is caught doing a good deed and wonders if becoming a super hero might not be such a bad idea after all. A fun, short bit of fiction. Another shorter piece is “Confidante” by Tim McDaniel. This a humorous poke at many of the superhero clichés out there. But it’s also a thoughtful tale about friendship, loyalty, and trusting too much. Astounding Man, aka mild mannered Rob Rupert, is a naive superhero, while his friend, Weldon Brown, is an amateur opportunist, chronically looking to cash in on this hero’s fame. When Rob pooh-poohs the idea of selling ads on his cape, Weldon lets his mind wander to more nefarious possibilities. The sad fun is finding out just how far Astounding Man’s confidante will go to earn his millions. The next interlude sets the stage for the third set of stories, a catchall category of fantastic adventures of “regular” superheroes. Two flash fictions bracket two longer pieces. “Steaming Mad” by John Michael Martin is an extended pun story featuring The Crab. To even mention the plot is to spoil the fun. Suffice it to say, if you like well-conceived groaners, “Steaming Mad” will deliver. The short set ends with “The Ironic Man” by Gareth D. Jones, a cute microstory about market branding and how difficult it is to come up with a superhero name that really captures the essence of the hero. My personal favorite, and probably the best overall story in terms of plot, character development, and complexity of the protagonist, is “The Silver Shadow” by Eric Ian Steele. A confused vigilante administers justice with a warped sense of morality. Admired by many, hated by most, feared by all, the Silver Shadow appears when needed, but always leaves a mess in his wake. The two detectives investigating his last crime/rescue scene are of different minds – one of them literally (hint hint) – as to what motivates this powerful yet unpredictable superhero. In the course of their investigation, they stumble upon a crime gang trafficking in mind-altering drugs that may explain the irrational behavior of the vigilante. Will the Silver Shadow give in to “the dark side” and be revealed as a mere criminal tool or will he become the protector of society the junior detective believes he can become? It takes a tragic crisis involving that very detective for the Silver Shadow to show his true colors. And the reader won’t know the outcome until the very end. That’s my kind of story. In her second story in this collection, Christina Lea offers us in “Mister Blue Sky” a quirky tale of young, arrogant, second-stringers with idiosyncratic monikers and strange powers. Citrus Shocker (named after the soft drink) gained her powers in an electrical mishap and ended up killing a bad apple named Rudy. Rudy comes back to life as an electrified zombie seeking revenge. She and her cohorts – Captain Scrappy, Cloud Goddess, Recycled Man, Firetemple, Starbryte, and Santa Claus (yes this story features a zombie and a Santa!) – all pull together to clean up another crime syndicate and try to earn a little respect from the elders. The fun repartee and oddball antics of this group of super friends make for some light and entertaining reading. Another off-beat tale is A. H. Jennings’ “A Dog, A Rat, A Mouse, A Cat.” Thea, a college student and coffee barista by day, is transformed via an ancient mask into a mysterious but honorable ape-like creature. With a sidekick monkey named Ket, Thea becomes or inhabits Brass Monkey, a powerful acrobatic soldier whose nemesis is the Prince of Cats. In this unique spin on the Jekyll and Hyde myth, the author weaves together a magical tale of chaos vs. order by combining elements of yin yang mysticism and urban paranormal. And the stakes are high – the city of Seattle is the battle ground between these opposing forces and its fate hangs in the balance. But Thea/Brass Monkey, uncertain of her powers yet empowered by an ancient and spiritual nobility, will attempt to meet the challenge. An inspiring and intriguing story. Incorporating a different myth into his story, Gustavo Bondoni gives us a tale about the trials of Gorgon in “Yet Another Bad Hair Day.” Gor’s a man who is misunderstood – he can’t help it if he’s the great great 3000-years-removed grandson of Medusa! But he can do his best to help Beta City clean up a criminal element that is raiding Hades and resurrecting ancient Greek heroes who are hell-bent on trying to kill Gorgon himself. It’s a fun premise and Bondoni does a good job maintaining suspense while keeping the tale whimsical and entertaining. And so when Gor finally confronts his nemesis and forces him to promise to stop resurrecting Greek heroes we don’t realize what a huge loophole that leaves the bad guy. Until the end when all hell breaks loose. A fun read. Wrapping up this collection with “Uncreation Myth,” editor Michael C. Lea ties up some loose strings and answers the question posed at the beginning of the anthology – what is behind the increased super human activity in and around Beta City? I won’t spoil the epic-in-the-making by revealing the answer here, but suffice it to say that there are bigger powers at work, powers who seem to have it in for the people of Earth and indeed the whole Cosmos. For those who enjoy supercharged battles, mysterious forces, and psychological twists, rest assured there is plenty to enjoy in this nicely done finale. I kept flipping back to earlier stories to spot the references and clues that helped lead up to the final reveal. Some readers may want more of a resolution, but given the nature of what is taking place in Beta City, the anthology ends right where it should. And it even leaves open the possibility of a second series of POW!erful Tales that just might introduce a whole new cast and open up a whole new realm of possibilities. POW!erful Tales is published as a trade paperback and can be found at the Peryton Publishing website, along with its other publications, here.